During the winter months, a frozen lake can be the center of many outdoor activities, including ice hockey, dog sledding, and ice skating. But another big winter pastime in the United States and Canada is ice fishing. While this favorite winter sport can be fun, it can also be dangerous. 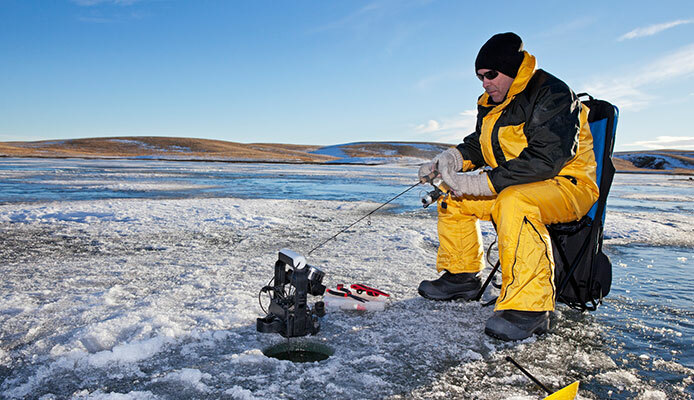 In some cases, serious injury or death has occurred due to unsafe ice fishing practices. So, if you’re angling to stay safe on any icy lake or river, let’s start out by tackling some of the root causes of unsafe ice fishing. Not dressing properly. Due to the risk of hypothermia, keeping your head, hands, and feet warm and dry is essential. Not packing adequate equipment. Death from drowning can occur if you’re not wearing a life jacket. Packing the right equipment, such as picks and rope can help you beat the odds. Excessive alcohol consumption. Drinking alcohol can slow your reflexes and reaction time, which can be risky in the event of an emergency. Excessive drinking also increases your chances of getting hypothermia, because alcohol constricts blood vessels and lowers body temperature. Falling through thin ice. Ice doesn’t freeze evenly on the surface of a lake or river, and thin patches can’t always be detected by sight alone. Ice strength is affected by current, wind, and other factors. Thin ice will not sustain the weight of a human, let alone a snowmobile, all-terrain vehicle (ATV), or truck. Bring a friend. Don’t fish alone. Also, make sure friends and family know where you’re fishing and when you plan to return home. Spread out. Do not drill too many holes in one place. The more holes, the less stable the ice surface. Wear a life jacket. Life vests have excellent flotation properties in case you fall into the water. Wear appropriate footwear. Crampons (or creepers) fit on the bottom of your shoes to give you more traction on ice. Spray them with vegetable oil to prevent snow or ice from sticking. Bring a pair of ice picks or screwdrivers. Keep them in your jacket in case you fall into the water and must pull yourself out. Make sure they have wooden handles so they won’t sink. Pack a rope. It’s easier to pull someone out of the water with a rope than by the arms. Avoid snow-covered ice. Snow has insulating properties, which prevents cold air from keeping the ice at freezing temperatures. Pack a first aid kit and matches. Keep these items in a dry and secure place so they will be usable in case of emergency. Keep away from shipping lanes. Tankers and barges disrupt the integrity of the ice, even if you’re fishing miles away. Park your vehicle on dry land. Refrain from parking your car or truck on the ice. The added weight could cause the ice around you to break. Copyright © 2019 Solucient Security, all rights reserved.